The Bulk Container Association (FIBCA) has created a set of guidelines for the use and storage of bulk bags in an effort to ensure safety. The guidelines cover everything from bag storage to filling to transportation. We will cover storage and filling in the first of our bulk sandbag use posts. 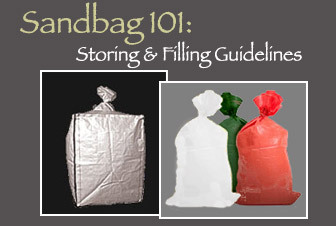 This article as meant to provide an overview of bulk sandbag use and should not replace a thorough review of the manufacturer instructions for the bag you choose. Always be sure that you are choosing the right bag for the job. Check the manufacturer guidelines to be sure that the material you are storing or moving in the bags is not incompatible with the manufacturer’s intended use BEFORE filling any bags. This includes making sure that the material you place in the bag is safe for that bag and that you know in advance the weight that the bag can safely accommodate. Bulk bags and sandbags need to be stored in a safe, clean, dry place to protect them from the sun’s UV rays and inclement weather. UV rays and moisture can significantly weaken the strength of the bag over time. Additionally, moisture may damage the contents of the bags if you are trying to store material that is needed for future use. It is highly recommended not to store bags outside but if you must store them outside be sure they are well covered with some type of waterproof covering that will also protect them from UV rays. The FIBCA makes clear that they do not endorse the practice of outdoor storage though as it can have an adverse effect on the stability of bulk bags or sandbags. Be sure that the bag you are going to use has been stored correctly so that it’s integrity is not at risk. There’s nothing worse than filling a bag and having it tear or fail. Check the bag over to be sure it is free of any initial tears or punctures. If you are using a bag with a bottom discharge chute, make sure the chute is closed correctly. Make sure the material going into the bag is compatible with the components of the bag. Do not overfill the bag past the manufacturer specifications for the weight the bag can safely handle. Make sure that the loops or sleeves are vertical to prevent any undue damage from lateral forces. Be sure that there are no sharp edges that could tear the bag and that the fork lift tines are strong enough for the load with rounded edges to prevent tearing. 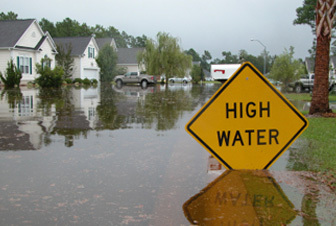 If hazardous materials are involved, extra precautions need to be taken to ensure personnel safety. You can read more about additional requirements on the OSHA site. 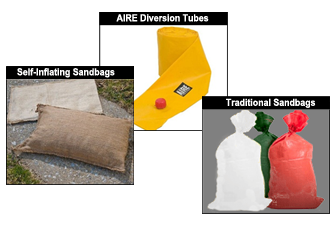 Traffic Safety Warehouse provides a large assortment of bulk sandbags for an array of jobs. You can always call us at (877) 966-1018 if you have product questions. Flexible Intermediate Bulk Container Association (Fibca). “FIBC Handling Guidelines Part 1 – Storage of Empty FIBCs.” (n.d.): n. pag.FIBCA. FIBCA. Web. <http://fibca.com/wp-content/uploads/2012/07/Part1_Storage_of_Empty_FIBCs.pdf>. Flexible Intermediate Bulk Container Association (Fibca). “FIBC Handling Guidelines Part 2 – Filling of FIBCs.” (n.d.): n. pag. FIBCA. FIBCA. Web. <http://fibca.com/wp-content/uploads/2012/07/Part2_Filling_of_FIBCs.pdf>.